Shoppers Guide - Jacksonville Granite Inc. The purchase of granite, marble, or quartz countertops is an investment in your home that will last a lifetime. As with any investment, research is an important first step. We here at Jacksonville Granite thought it would be helpful to put together a Shopper’s guide to help educate you on the process of stone countertop fabrication, installation, and maintenance as well as a few considerations to help you in selecting a material. The first step would be choosing a material to have your countertops made from. There are a few different options, so let’s have a brief look at them. Granite is a natural stone and the most popular choice for countertops. 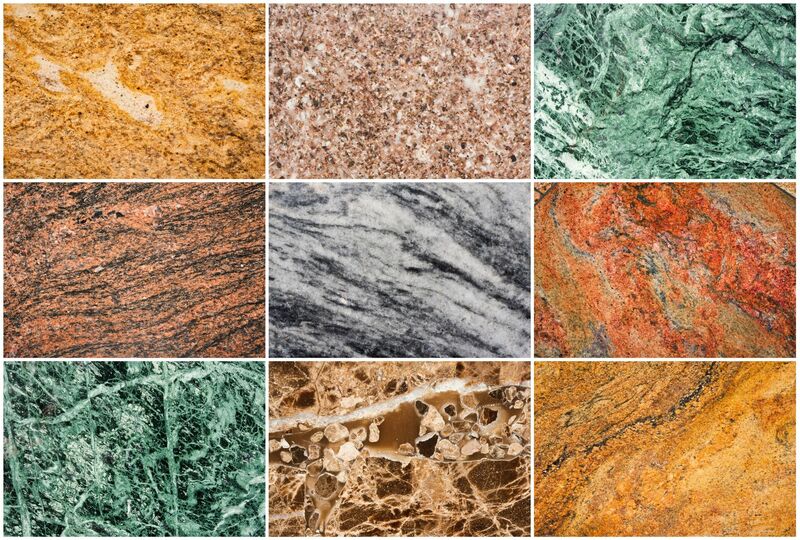 Granite comes in a myriad of colors and patterns so you are sure to find one that suites your décor. This natural stone ranks 7 out of 10 on the mohs scale of hardness (A Diamond ranks 10) and is nearly unscratchable. Granite is also extremely heat resistant and will not be harmed by hot pans. Your granite countertops will need to be sealed to protect against staining. Sealers have come a long way in the recent years, are easy to apply and can last for up to 20 years. Overall, granite is a great low maintenance and durable option for your countertops with unmatched natural beauty. Marble is a natural stone known for often having attractive veins and patterns. Marble is softer than granite and therefore not as scratch resistant. Most marble ranks 3 out of 10 on the Mohs scale of hardness and is heat resistant. Your marble countertops will need to be sealed to protect against staining. Sealers have come a long way in the recent years, are easy to apply and can last for up to 20 years. Overall, marble is a very beautiful choice for countertops but careful consideration should be made when choosing this stone. Talk to your fabricator about whether or not marble is right for your particular application. Soapstone is a natural stone normally found with a very soft polish and attractive look. This stone is impenetrable and therefore cannot be stained making it a great choice for countertops. Soapstone needs no sealer. In fact you cannot seal it because of its non-porous nature. Some people will apply oil to the surface to enhance the color of the stone. Soapstone is softer than granite and therefore easier to scratch. Light scratches are easily repaired with 220 grit sandpaper. Overall, soapstone makes for a great countertop due to its beauty and non-porous nature. Quartz or engineered stone is a composite of quartz and resin manufactured for countertops. There are several brands of this type of countertop material. This type of manmade material comes in a variety of colors and usually has a more consistent pattern across the slab. Quartz countertops are not as scratch resistant as granite but harder than marble. There is no need to seal Quartz countertops. It is not a good idea to put hot pans on the surface of these countertops as they can be permanently damaged by the high heat. Overall, quartz countertops are relatively heat and stain resistant while offering a wide variety of colors to choose from.